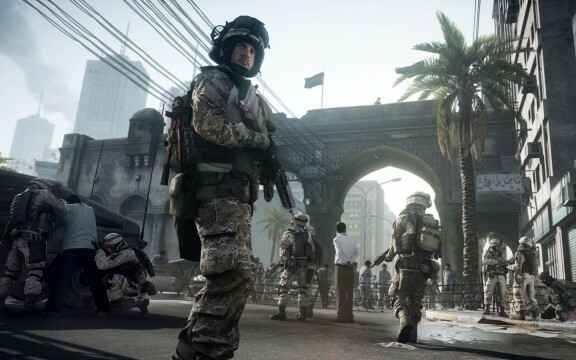 Battlefield 3 is the first real threat to the Call Of Duty name since the monolithic success of Modern Warfare 2 propelled the military shooter into the celestial clouds of gaming paradise. Activision has been completely dominating the online gaming communities, not just the entire FPS genre. Black Ops however, managed to trump its predecessor and went on to become the most successful videogame of all time (no mean feat), but arguably this is largely due to a cumulative effect of anticipation that should in part be credited to MW2. Battlefield 2 received heaps of praise from critics but Call Of Duty still held the sheer weight of numbers over EA’s heads. So now we are in 2011 (just in case some of you really have been playing Black Ops too much) and the tides look like they may be turning. Infinity Ward are but a shell of its original team and Activision are pouring more than one development studio into MW3, whether or not last year’s disruption will affect the quality bar is yet to be seen. DICE on the other hand are in top fighting form, and are promising an impressive graphical upgrade via the horsepower of a two years in the making Frostbite 2 engine, and are utterly focused on taking Call Of Duty’s throne. It’s the largest and most obvious competition this generation of consoles has seen and it’s already begun. Both Activision and EA are going to be marketing as much as physically possible, swarming the world with advertising campaigns, attempting to win the loyalty of gamers and undermine the other publisher’s efforts. Modern Warfare 3 hasn’t officially been announced yet but Activision continues to tease that ‘2011’s Call Of Duty plans’ will start appearing in the next few weeks. Everyone has got their head around the pattern by now and we all know it is going to be coming out around autumn this year; the only thing remaining is the formality of the announcement. So let’s quickly overview what little we know about each product and what we are expecting from them both. EA have been hypnotising everyone with their Fault Line trailer collection since last month in a bid to capitalize on Activision’s distinct lack of announcement and general silence. The gameplay footage is undeniably stunning, and boasts among the most impressive looking visuals we have ever seen, but whether or not the finished product will look this polished across all the platforms is anybody’s guess at this point and if the all important online multiplayer can consistently deliver such a standard of graphical prestige. EA’s hard hitting initial pre-sale is solely driven by the beefy technological upgrade DICE’s brand new game engine can offer. We have virtually no information on how the rest of the game is structured, or what new gameplay mechanics and features are being added. Information on Modern Warfare 3 is even more sparse (for obvious reasons) but there are strong rumours and indications that Activision’s new studio Beachhead (specifically working on online digital content) are developing the long-time-coming and dreaded CoD subscription model. The premise reportedly being that gamers will have the option to access premium content such as exclusive maps, special matchmaking lobbies, and in game customizations by signing up to a monthly payment plan, similar to many ‘free to play’ titles…except you will still have to buy the game in the first place. So we could be looking at some fundamental and dramatic changes to the CoD experience – which may or may not put people off. Despite Activision’s assurances that current online services will continue to be free, no doubt the company is carefully planning an extension in the form of a profitable business model, perfecting some irresistible layer of extra multiplayer content – figuring out how to convince everyone they want the bonus stuff. Interestingly and maybe importantly, Infinity Ward creative strategist Robert Bowling recently tweeted that he doesn’t think the game engine needs replacing, responding to a fan question with “An engine takes years and years to develop and get right. That would be counter-productive”. If this is to believed then it could mean MW3 will be running on a game engine that is already showing its age, square that possibility up with the might of the Frostbite 2 and 2011 begins looking a little less CoD coloured. At this (admittedly early) stage it seems that EA are striking the CoD kingdom when it is at its most vulnerable. Perhaps it is Activision’s fault and lack of foresight that has put them in this uncomfortable situation? Then again maybe this year’s CoD reveal will surprise everyone with some groundbreaking stuff, but no one can quibble that Battlefield is in with a serious chance this time around, finally. The two rival companies are without a doubt eyeing one another across the playing field already. Expectations are high for both games, but where would you put your money?